Apple tends to stick to a fairly predictable annual schedule nowadays, and if previous years are any guide, we should soon be hearing more details about the successor to OS X El Capitan. 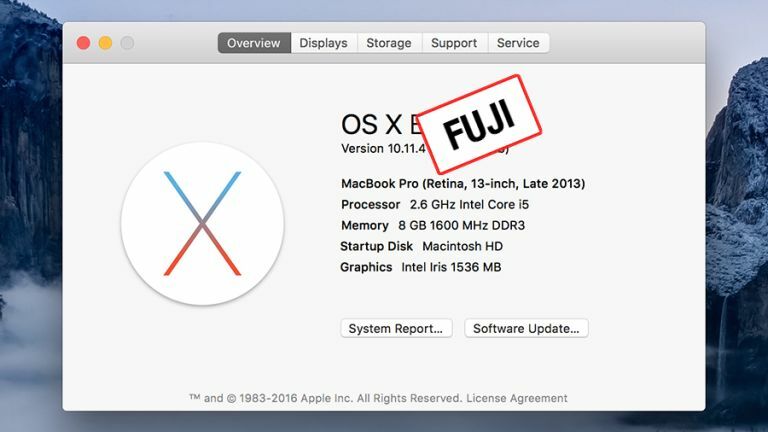 The brand new operating system is apparently going to be called OS X Fuji. All this is speculation and informed rumour of course - Apple won't say anything official until its WWDC (Worldwide Developer Conference) event kicks off on13 June. That's where we've seen on-stage reveals for Yosemite and El Capitan, and we're expecting the same sort of show for Fuji this year. Apple's desktop operating system is now at a stage where it's slowly evolving and being refined, year on year, and the major shocks in terms of new features are few and far between. Last year's El Capitan bump was very much a minor upgrade for Mac users. That said, it's worth remembering that Apple updates all its software - Mail, Maps, iTunes and so on - at the same time as OS X, so there should be plenty to talk about once Tim Cook (or one of his executives) steps up to announce the new features in San Francisco. In the background is Microsoft's attempt to bring the desktop and mobile devices together with the same Windows 10 software - a strategy that Apple has so far refused to copy. OS X and iOS are closely linked but remain separate entities, at least for the time being. Among the headline features introduced with 2015's El Capitan were improved Spotlight search, window snapping, a major Notes upgrade, tab pinning in Safari, public transport directions in Maps and a bunch of performance and stability improvements. Will OS X become MacOS? One of the most interesting and most plausible rumours surrounding OS X Fuji is that Apple is planning to rebrand its desktop OS as MacOS (or possibly macOS). That would fit in with iOS, tvOS and watchOS, which makes us think it's likely to happen soon. Further evidence: a new environment page on the Apple website that originally referred to MacOS - the reference has since been changed to OS X instead after the whole internet noticed the mistake. A slip of the keyboard or a sign of an imminent, major rebrand? There have also been hints in the OS X code that MacOS will soon be the name for the software running on Macs. Many Apple users already refer to the platform as Mac OS informally, so it makes a lot of sense that Apple would want to make it the switch official. We're still not quite sure of the story behind the Fuji name - maybe it's because the Fuji apple is grown on California - but it's the one that several reports have pointed to as the codename currently in use. There's still a chance Apple will change it before June. There's a lot of speculation that this is the year Siri is going to make the jump to OS X (or MacOS) and it seems overdue at this point - the digital assistant is becoming more and more important on iOS, but what about those times when you need help on your laptop? The arrival of Siri is potentially going to be the 'tentpole' feature of Fuji, according to reports. It's already made it to tvOS, and with Google Now and Cortana spreading everywhere, we think it's highly likely that Apple is going to unveil Siri for Mac this year. Major updates are coming to the Photos app too, says Japanese site Mac Otakara, and again this is an easy one to believe. Google Photos is fast, simple and comprehensive, and Apple will want to keep up: extra editing features have been mooted, for example. Upgrades to the file system, both local and on iCloud, are on the cards too according to reports. Most of them won't affect casual users too much, but it's possible that accessing your files from any device and backing up to Time Machine will get easier. In terms of major rumours, there's not much more to report: an iTunes redesign has been talked about for a while now, so Apple could use WWDC 2016 to debut a brand new look for its all-singing, all-dancing media management suite (it's certainly due an overhaul). Ways of using OS X and iOS together have been prominently featured ever since 2014's Yosemite release, and it's likely there'll be some more news here - Apple knows how influential the iPhone is and is going to want to continue to capitalise on that. Speed and stability improvements are a given. They may not get the biggest cheers from the crowd, but they mean you're going to be able to get more from your hardware, whether that's in terms of loading pages in Safari or eking out more battery life. If Apple follows the pattern of years past, OS X Fuji will be a free upgrade, with a public beta launching almost straight away and the finished software available sometime in the autumn. Of course as soon as any official news breaks, we'll bring it to you on T3.